The global medium molecular weight polyisobutylene market is consolidated in nature. According to a report by Transparency Market Research, the market has handful of players engaged in majority of shares in the market. These manufacturers in the market are adopting various strategies such as mergers and acquisitions. They are also engaging in joint ventures and expansion of their companies to increase their customer base and market reach globally. Entrance of new players in the market will rise the competition significantly. Some of the leading players in the market of medium molecular weight polyisobutylene market are Shandong Hongrui Petrochemical Co. Ltd., BASF SE, JX Nippon Oil & Energy Corporation, and Zhejiang Shunda New Material Co. The global medium molecular weight polyisobutylene market is anticipated to rise at a healthy CAGR of 4.3% during the forecast period of 2015 to 2023. The market value was US$420.5 mn during 2014. It is expected to reach US$610.1 mn by the end of 2023. According to application segment, the global medium molecular weight polyisobutylene market adhesive held 40% of the global share during 2014 and it is expected to lead the market. Geographically, Asia Pacific led the global medium molecular weight polyisobutylene by holding 35% share during 2014. Significant growth in this region is expected during the forecast period as well. The rise in demand for adhesive and sealants in lubricating oils are expected to augment the market. Developing economies are increasing manufacturing based industries to meet the demand of consumption. 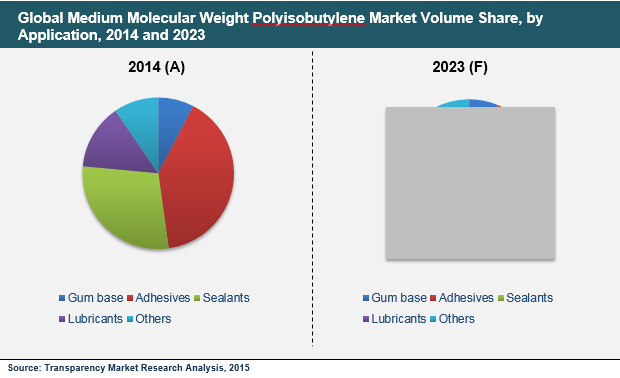 Increase in chewing gum is also expected to rise, leading to growth of medium molecular weight polyisobutylene market during the forecast period. There is increased demand of medium molecular weight polyisobutylene in roofing sealants, pressure sensitive adhesive, and cable glazing applications leading to rise in demand in the market. It also plays a vital role in the usage of polymer based and hot melt adhesive formulations. It had demand in automobile industry and the growth in automobile industry will lead to rise in demand for medium molecular weight polyisobutylene as well. Its properties of good adhesion, elongation, and moisture resistance increases its demand in manufacturing of sealants and adhesive. Increased industrialization is expected to fuel the demand for lubricants in the market. Medium molecular weight polyisobutylene is largely used for manufacturing of agricultural chemicals, inner tubes of tires, chewing gums, pulp and paper, and caulks. This increases its demand in the market. It is highly resistant to salts, alkalis, and acids leading to rise in market. It is also used many times for achieving the properties of final products. These factors will augment the market and increase its growth during the forecast period. The global medium molecular weight polyisobutylene is expected to face restrains in the market due to some factors during the forecast period. It has potential to harm aquatic creatures and thus government is concerned with its usage in different products by various industries. Government is exercising stringent regulations on the usage as well as manufacture of medium molecular weight polyisobutylene due to this reason.